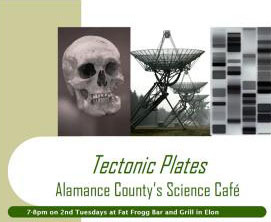 Each month on 2nd Tuesdays from 7-8pm a different scientist will present engaging science at Fat Frogg Bar and Grill in Elon, NC. All Tectonic Plates events are free and open to the public, and you can expect a lively event in a relaxed atmosphere without all the technical jargon. Tectonic Plates runs from September through May. Our April 9th event features Andy Lamb, a doctor at Alamance Regional Medical Center. His visit is titled "Opioid addictions and pain management - 30 years of medical practice"